I wanted to share a game that I have up on Early Access at GameJolt and itch. I also launched a Patreon which doubles as a devlog to explain some of my thought processes in telling this story. 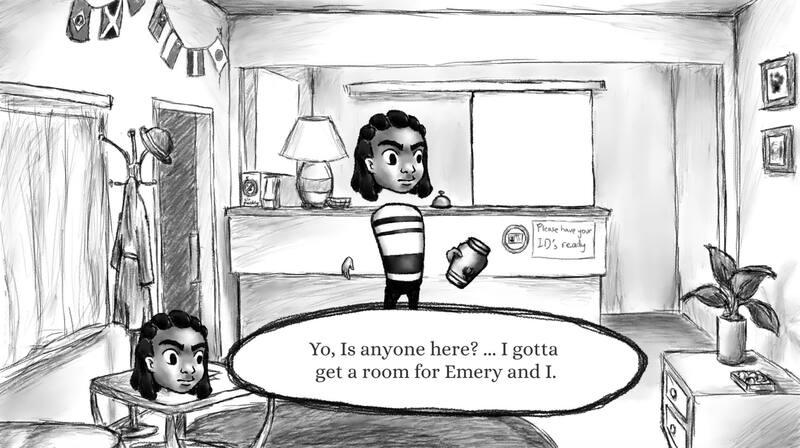 For Emery is a point & click adventure game/interactive novel, with a basic inventory system where Germaine would be able to (eventually) store some items found in some levels. 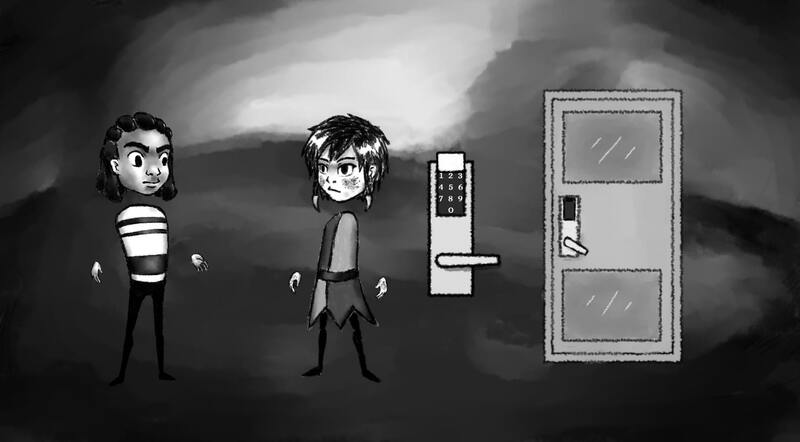 I took some inspiration from Samorost and Machinarium for the point & click mechanic and aesthetics (it does have a few Tim Burton-esque undertones too), though the storyline is a much longer story that I talked about in my GameJolt devlog. Looking cool! I'm always here for other story and emotion-focused projects! I've updated the devlog with some excerpts on the original script today. Otherwise, production on the cutscene with the big reveal is going pretty smoothly. It's probably the longest cutscene in the game itself, as there are lots of tidbits to control in there, like animated box frames, "glitches", etc. Can't wait to share it once it's done! However, yesterday night I finally figured out how to drag & drop! Nevertheless, the bugs are still persistent! What's up with Germaine's hand here despite tossing out all the props? Is it no wonder Germaine rhymes with pain? That bug shall be addressed in another day. But there you go, it's a minor update, and the first half of the major cutscene is done. Second half will require me to set up a new scene. It's a bit weird to try and explain fully without spoiling it though. Pushed out a 0.4.2 Mac update and 0.4.1 Web and PC update - with the cutscenes as mentioned! I've also been busy working up a presskit for journalists, and am pretty confident that pushing content up to the cutscene would be pivotal in getting people intrigued, but I must admit that the impostor syndrome is kicking in pretty hard. 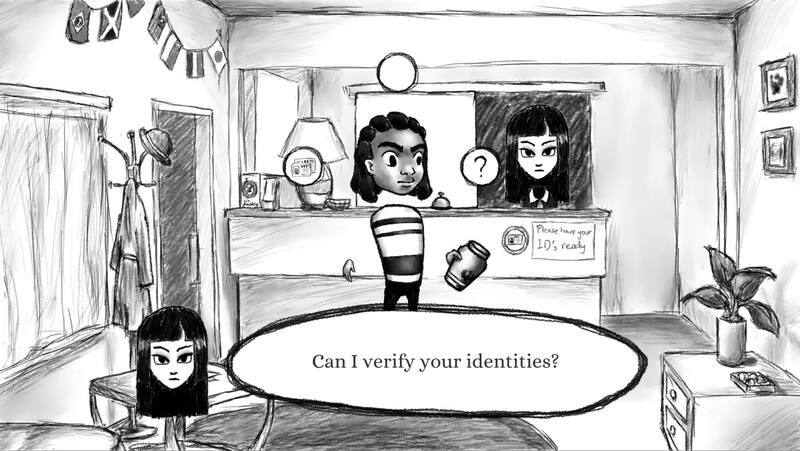 With that said, there's also a game trailer out too (that features a little bit of the cutscene I was working on! I'm back from my trip, so I should be in the stage where I can make progress with the game. However, it's going at a much slower pace than I like, with the holiday season and all. However, I want to take a moment to thank Warp Door for featuring my work! Anyway, what's holding me back a little more is the fact that I have been on a job hunt, and doing some of these tests for the job has taken time away from game production. It's more of a necessity on my part as I've been learning nothing but really bad practices at my current company (I think the only good thing that came out was the network), so my priorities are set on getting my skill sets and my moral compass (and career?) back on track. Because what game would be complete without a water level, right? Right?? Until the next one, cheers! Ooh, it's great that you got featured on Warp Door! If you haven't gotten much other responses to the presskit, that's still a good sign that your game is interesting enough that journalists might be waiting for a bigger announcement, like a trailer or a launch date. I finally read your message, btw! Since it's sometimes so easy to miss those on here, I thought I'd let you know I sent one back. interesting style. 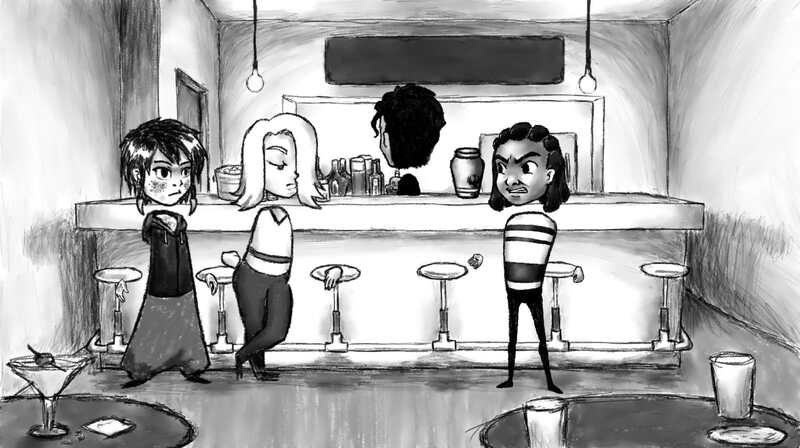 a black and white game like an old cartoon. Thank you for your comment! Yeah, that's the style I'm going for. In any case, Patch 0.5.0 is live with some changes to the storyline! I explain a little bit about that on my Patreon. Very interesting art style! It's got a Machinarium vibe to it that jives well with the story (which is also interesting)! The item button sounds are super clicky and satisfying! It'd be great if the items would disappear if we clicked elsewhere though. Also, some of the interactables were really hard to find in the Nercomancer scene. I couldn't see the urn or the ice bucket which were on the same table haha. The Hint button helped a lot in those parts though, so good job on that too! Keep up the great work and good luck with everything else in life! I'll be following! The item button sounds are super clicky and satisfying! It'd be great if the items would disappear if we clicked elsewhere though. This is actually an interesting bug that only appears for all of my web builds, but not in the standalone builds There is code that makes the UI retract back into Germaine that works in standalone. Unity is a strange beast. I'm done with the art assets needed for the first branching path. But man, I'm having feels like these two. It's been a pretty wild ride, with a lot of self doubt creeping in especially at the early stages. Lots of thoughts like "Are these puzzles too easy? My art is so subpar compared to some other better VNs and games out there. Who do I think I am to try and create a game anyway?" But I slowly pulled through. And I certainly hope the finale of the story delivers its emotional punch from a lightweight like myself. Yeah, credits are important, and I completely overlooked that during development. But it shouldn't take too long, I think? As I type this, I have sent a build for my best friend to try out and get feedback. I messaged her "...I think I finished my game :O"
I guess a better word for this would be a content lock since I've been keeping track of Wandering Ben's devlog - I'd trust a game veteran for terminologies like these. I feel like trying my luck at pitching to game journalists a couple more times before releasing the game at least 7 days later. In the meantime, I've also reminisced about when it all began. I told my best friend I think I worked on this game since mid-January last year. But to my surprise, "spritesheet.psd" had a timestamp that said "Created: 7/1/17"
Oh, a story-focused project. Color me black and... Err, I mean, color me interested. I have my post-mortem up. It's about time I should anyway. With that out of the way, I should start a new thread once I'm ready to show the dev community what I'm up to then. I've also started re-thinking about whether it serves me well to have a Patreon account. By most accounts, it's not sustainable to keep having to post towards a hypothetical audience, and I definitely want to explore topics beyond just game development in my writing in general, so I think I would shift towards posting on Medium for more in depth coverage, so that there is less pressure on crunching out updates, and more time given to writing well thought out posts too. What are your experiences with Patreon in general? Did it help you or hinder you?